Tickets for the Salon of Shame are known to sell out within minutes, but we reserve a portion of our tickets for Deaf & Hard of Hearing patrons and their guests. These tickets are not available to the general public and don’t sell out quite as quickly, although they generally sell out within a day. Deaf & Hard of Hearing tickets are available for purchase at the same time as our General Admission tickets. Please email ASL@salonofshame.com for details on how to obtain the ticket password. Important note: The password is distributed to the Deaf & Hard of Hearing patrons only – hearing people who wish to sit in the ASL section must be guests of Deaf patrons. There are still great views of the interpreters for hearing people in adjacent sections. If you are Deaf or Hard of Hearing and have a general admission ticket, send us an email and we’ll make arrangements to seat you in or adjacent to the ASL section – but if you buy an Deaf & Hard of Hearing ticket, we’ll know automatically to save a seat for you. It makes things easier. 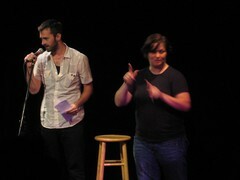 Deaf & Hard of Hearing tickets are not intended for ASL students. Please purchase a general admission ticket — there are still great views of the ‘terps from adjacent seating sections. If you have questions about ASL interpretation at the Salon, please email ASL@salonofshame.com.